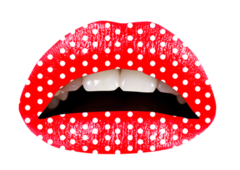 You’ve probably seen, and maybe even tried, patterned stick-on nails and wacky stick-on lashes; well, now your lips can get in on the fun/sticky business with some wild temporary lip tattoos from Violent Lips. Designs are all a little over-the-top so far, with styles like animal prints, glitter, rainbow, polka dot, roses, checkered, stripes, and fishnet (patriotic stars-and-stripes and Union Jack styles will be available soon), but I wonder if Violent Lips might think to include subtle, solid, and, uhm, less "violent" tattoos for women looking for a lipstick alternative that actually sticks. Apparently, the product is easy to apply and can be removed with baby oil or mineral oil and a textured wipe.